The instance Bookclub-in-a-Box presents the discussion companion for Martin [i.e. 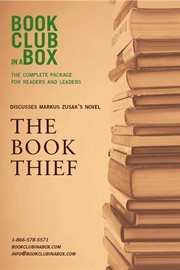 Marcus] Zusak's novel The book thief, (electronic resource) represents a material embodiment of a distinct intellectual or artistic creation found in San Francisco Public Library. This resource is a combination of several types including: Instance, Electronic.